The Corman Shepherds are a cross breed resulted from the mix between the Corgi and the German Shepherd. With such intelligent parent breeds, the result could not have been different. The Corman Shepherds also inherited the herding instincts, so training is very important if in controlling these instincts of theirs, otherwise they will practice it on anyone, including their owners. With the necessary training and care they turned out to be good family dogs, with a life expectancy of up to fifteen years. The Corman Shepherds are considered a designer dog breed or hybrid. This kind of dogs has gained more and more popularity during the past few decades. 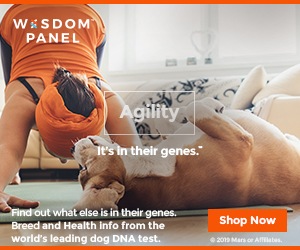 Because nowadays there are so many breed mixes, between dogs that are so different from one another, it is very difficult in some instances to identify when and why was a hybrid first created. The Corman Shepherds are also one of these cases, but in order to understand them better, it is important to study a bit the characteristics of the parents. The birth of this breed took place at the end of the nineteenth century, when a German officer wanted to obtain the best choice for a herding dog. These dogs grew in popularity quickly, but the herding needs from dogs decreased. The WWI was an opportunity for the German Shepherd to prove intelligent and excellent in military duties, such as sentry, search and rescue, carrier, messenger and guard. This was noticed by the Allies as well and they took a few back in the States with them, where these dogs carried out successfully further duties for the police and military sectors. Although the German and the American breeders used slightly different methods of breeding them, some of their characteristics did not change, such as intelligence, loyalty and energy. Shepherds are wary of strangers and will be reserved, but once they get to know a person, they will prove to be quite friendly. 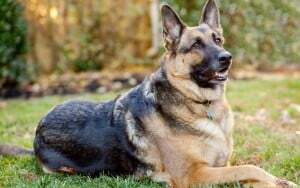 German Shepherds are not fond of being left alone, but are very easy to train and will react very well to training sessions, due to their intelligence and desireto please their people. As the name itself easily betrays, the Pembroke Welsh Corgi comes from the Pembrokeshire region in Wales. Local legend has it that the Corgi’s were used by the fairies and elves to pull their carriages or were ridden in battles. 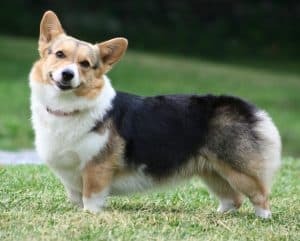 Legend aside, there are two scenarios that would explain the arrival of Corgi’s in Wales: they were either brought by the Flemish weavers in the twelfth century, or are the descendants of the Swedish cattle dogs since the ninth century. Queen of England herself is very fond of Corgi’s, who manage to be both good family and working dogs. These dogs are intelligent and generally easy to train, although they can prove to be stubborn and independent sometimes. They love to please the humans and can be easily motivated with food treats. However, feeding needs to be careful supervised, as there are risks of obedience in their case. The good temperaments and intelligence of the parent breeds have been passed on to the Corman Shepherds. Bold and active, these dogs do need proper training and socialization, as they will have the tendency to herd their families at times. They need to be in people’s company as much as possible, as being left alone can have negative effects on them and determine unwanted behavior. In exchange for the necessary attention, they will provide affection and loyalty. The Corman Shepherds can grow up to 40 centimeters tall and reach weights of up to 35 kilos, which label them as medium to large sized dogs. Despite the short legs inherited from the Corgi, they have sturdy body builds and well proportioned on the overall. Black eyes and pointed ears are part of the flat head. Their coats are most often medium to short, very dense, but allowing easy brushing and can come in colors such as golden, black, brown or white. The Corman Shepherds are active dogs with generous energy reserves, so this means they require a rather consistent level of physical exercises. Daily walks and playing sessions are the least they should receive in order to keep fit. They love going to parks, so take them there as often as possible. Lack of proper physical activities leaves them without proper mental stimulation and will most likely lead to unwanted behavior at home. The intelligence and the nature of the Corman Shepherds allow them to be easily trained and, even more, to be brilliant during training sessions. Despite the stubbornness they sometimes manifest, with a bit of patience, firmness and consistency the process can be successfully carried out. It is also important to see the trainers as the dominant characters and, therefore, the pack leaders. This way they will always be obedient and respect any decision coming from them. Even if they are very clever, the socialization with other people and pets, as well as the training process need to start when the puppies are very young. The Corman Shepherds are the shedder type and even if their coats are relatively easy to brush, the brushing will be required on a daily basis in order to remove the dead hairs and prevent them from being spread all over the house, but, at the same time, will maintain a good-looking, healthy aspect of the coat. Even so, a more frequent use of the vacuum cleaner will turn to be needed. Bathing is also a requirement and, even if it won’t be needed very frequent, it will help with the shedding. Besides the coat, the rest of the grooming necessities are similar to those of other dog breeds. Their nails need to be clipped and teeth and ears also require having their hygiene properly carried out. The ears can be taken care of by using damp cloth and their teeth require special dog toothpaste cleaning two or three times per week. Nail clipping requires special care, as there are blood vessels which can be damaged if clipping is not done properly and will lead to injuries. Professional groomers are available for such activities. The Corman Shepherds are getting along very well with children and proved to be excellent family dogs. Early socialization and training are very important for the later development of puppies and will facilitate easier acceptance of other pets, although cats may be a problem and these dogs may find them hard or impossible to tolerate. Corman Shepherds’ feeding needs to be carried out using good quality food. The quantity will depend on the actual size of the dog, but it can get up to 3 cups per day, maybe split in two or three separate meals. Their appetite makes the Corman Shepherds prone to obesity, so it is extremely important to have their feeding under control and also pay attention in case they manage somehow to put on some weight. They are alert dogs and will react promptly when they sense strangers or any potential danger, thus making good guards and watchdogs. The health of Corman Shepherds is a pretty good one on the overall, but there can be some risks of genetic transmitted health conditions. Besides obesity, a few of these are joint dysplasia, Bloat, allergies, back problems and eye affections.It is not difficult to get a Corman Shepherd puppy, as this cross breed is quite popular these days. For the right price which can range from 200 to 600 USD, anyone can get such a puppy, but there will also be subsequent costs which will be required for a good care of the puppy, for actions such as vaccinations, health checks, de-worming, neutering, microchip, leash and collars, which are only the most common ones. All these will raise the initial amount by around 500 USD. Of course, some of these will be required to be carried out periodically, in order to have all health aspects under control. Besides these, food and toys will be the constant needs which will need to be purchased. Active dogs, the Corman Shepherds will be best to receive owners with an active lifestyle for a perfect match. This will ensure that these intelligent and active dogs receive all the mental and physical stimulation, so they will develop healthily and will prevent unwanted, destructive behavior. It is important for the owners to know that they need to impose as leaders, to get the respect and obedience of these dogs, who can act very independently at times.